This park has a play structure. The complex also includes five baseball/softball fields (two of which have outfield fences), three soccer fields, a recreation center, a Bocce court, three tennis courts, two play areas and two basketball courts. 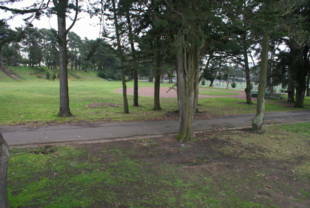 There are picnic tables and restrooms, and grassy area, and the park is dog friendly. Crocker Amazon Park is owned by the San Francisco Recreation and Parks District. It started out in 1933 as the Crocker Amazon Reservoir site, 55 acres at Geneva Avenue and Moscow Street belonging to the Public Utilities Commission. In 1934, the Recreation Commission requested and received permission to develop the property for recreational purposes, and truck farmers, who had been working the land, were paid for their leases. The Recreation Commission leased 42 acres for $150 per month. From 1934-1937, workers from the WPA (Works Progress Administration) developed the playground, grading the baseball diamonds and installing a sprinkler system. During the war years, the Navy commissioned the property for a hospital. When the Navy vacated the site in 1946, it was turned over to the San Francisco Housing Authority to provide housing for veterans during the post- war housing shortage. Crocker Amazon was reborn as a playground when, in 1957, the PUC granted the Recreation and Park Commission the right to 'occupy, use and improve it.' In the ensuing dispute over who would be responsible for its restoration, the job fell to the SF Housing Authority and the PUC. Known both as a playground and a park, Crocker offers a range of facilities for the increasingly diverse community it serves. It encompasses five baseball diamonds, one of which is lighted, two lighted basketball courts, three concrete bleacher structures (two with restrooms), six tennis courts, a bocce court, three play areas and a recreation center. 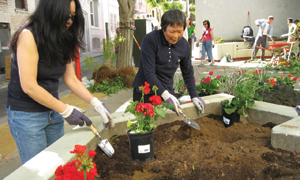 Over the years, neighborhood groups have lobbied steadily for better maintenance, repairs and improvement. 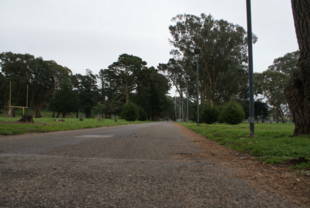 In 1979, when Mayor Dianne Feinstein announced a $508 million federal grant with matching funds from local irrigation bond money for improvements to McLaren and Crocker Amazon Parks, Crocker's list of problems included repair of stairs, fencing, children's swings and sandboxes, clogged sewer traps, and initiation of a gopher control program . The community won its extended fight for a clubhouse in 1980 when Rec and Park's General Manager Tom Molloy announced that funding was in place with a $420,000 grant from Rec and Park, the Redevelopment Agency, and the State of California's Department of the Interior. A neighborhood resident, Armida Adan, donated approximately $15,000 to pay for the building plans and move the project along. The clubhouse includes a large, multipurpose room for community meetings and events, a director's office, an arts and crafts room, a large kitchen, and bathroom facilities. On March 21, 1981, Mayor Feinstein dedicated the building at Moscow Street and Italy Avenue. The Outer Mission News ran the story alongside a report of an angry neighborhood meeting in which COMO (Committee of Outer Mission Organization) and the Epiphany Men's Club laid out their concerns over the park's deterioration -- shabby fields, graffiti, downed fences, and regular vandalism -- as well as a lack of Park Patrol security, and a minimal gardening staff of only two who were also assigned to other parks. The situation began to improve in the late 80s. An allocation to Crocker Amazon of $1,881,600 from the 1987 State Park Bond went into new irrigation, new lighting, reforestation (with continued staffing for three years), asphalt, fencing, a new playground on the Moscow Street side and a new parking lot on the park's east side. 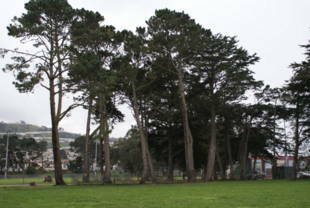 In 2000 Crocker Amazon Softball Fields were dedicated to reopen 3 newly renovated fields at the Park. A partnership between the San Francisco Giants Community Fund, Good Tidings Foundation, the Olympic Club and the Recreation and Park Department, this effort funded $300,000 worth of improvements. In Diamond No.1 and the other fields more than a quarter million square feet of new sod, a new backstop, base path cinder, fencing, paint, two new scoreboards and repaired and painted the bleachers. Baseball Diamond No.2 was renovated for mixed use; hard ball, softball, older players and young kids; young kids in the T-ball leagues for Little Leaguers have upgraded Diamond #5 for use. 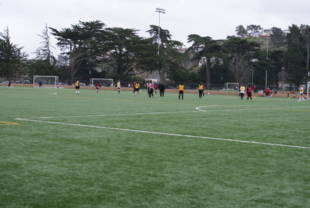 In addition, a new grass area was added to accommodate a mixed-use athletic field including cricket field play. Rec and Park also provided $500,000 to fund the skateboard facility which opened in 2001 on the east side of the soccer field. In September 2002 a newly built football field opened at the park. Funded by the San Francisco 49ers, the NFL Charities Youth Football Fund and LISC, the country's leading community development support organization, the group awarded $100,000 through the NFL Grassroots Program to the Good Tidings Foundation to construct the field. This is one of 71 fields in a $6.3 million program that has built football fields in socio-economically challenged neighborhoods in 40 cities across the country. Crocker Amazon Park also features an off-lease dog park, one of 13 in the City. Located between LaGrande and Dublin streets in the northern portion of park and adjacent to the LeGrande Community Garden, the unfenced Dog Park is open Daily 6 a.m.-10 p.m. The Parks Open Space Citizens Advisory Committee (PROSAC) recommended $10,000 to renovate the children's playground at Moscow and Geneva Streets. The Crocker Amazon 'Purple Playground' opened July 1, 2003. In 2007 the community group Friends and Advocates of Crocker Amazon and the Excelsior (FACE) in partnership with NPC, RPD and Precita Eyes Mural Arts Center obtained a Community Challenge Grant Program to continue enhancing the playground and engage the park users in maintaining the playground and park. The playground seating benches and 'boat feature' sandbox are being decorated with community-designed themes in colorful mosaic tiles depicting the history and diversity of this neighborhood. Families and visitors are encouraged to volunteer to place tiles into the design. To be completed late spring, the Crocker Amazon Mosaic Tile Art Murals are expected to be an artistic addition to the City's collection of mural arts and both a neighborhood and a visitor destination. In summer 2008 RPD, in partnership with the City Fields Foundation will complete the replacement of the grass soccer fields with artificial turf, redesigned to accommodate five full-size soccer fields available for play year-round regardless of the weather. The existing field lights will be replaced with new and more focused light on the fields. The new fields will add approximately 12,358 hours of playtime on the soccer fields per year - enough time to host soccer games for 395,450 players, including the City's more than 1,500 K-12 school and youth league teams. A bathroom/concession building and maintenance building will also be constructed.